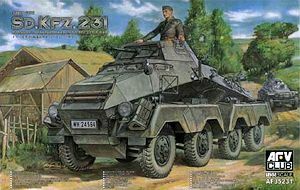 Following on from the release of the schwerer Panzerspäehwagen Sd.Kfz.231 (8-Rad) Early type (kit #AF 35231) late last year AFV Club have now released the schwere Panzerspäehwagen (Fu) Sd.Kfz.232 (8-Rad) Early type which is basically the same vehicle with the inclusion of the large frame antenna and a few other minor details. 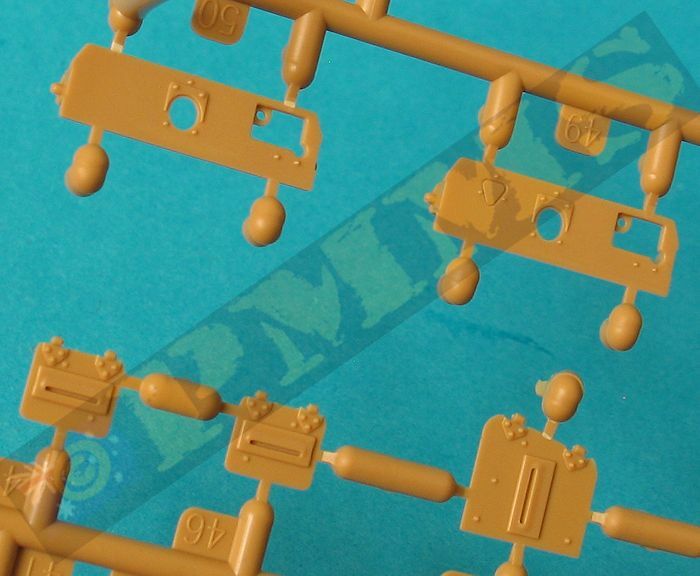 As such and the fact I never got to review the initial Sd.Kfz.231 due to time constraints I will review both kits together as they like the actual vehicles are the same apart from the inclusion of the frame antenna for the Sd.Kfz.232. 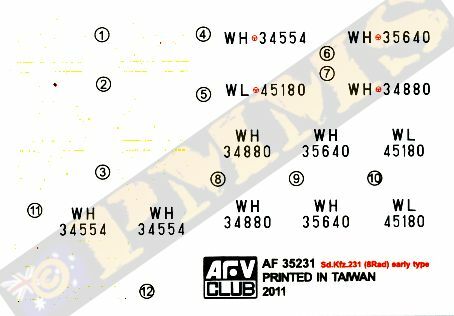 Therefore all comments apply equally to both kits with additional comments on the Sd.Kfz.232 parts where applicable, I have also incorporated the new AFV Club Sd.Kfz.231/232 Barrel and clearance indicator pole set (#AG35035) to show what you get with this as well. 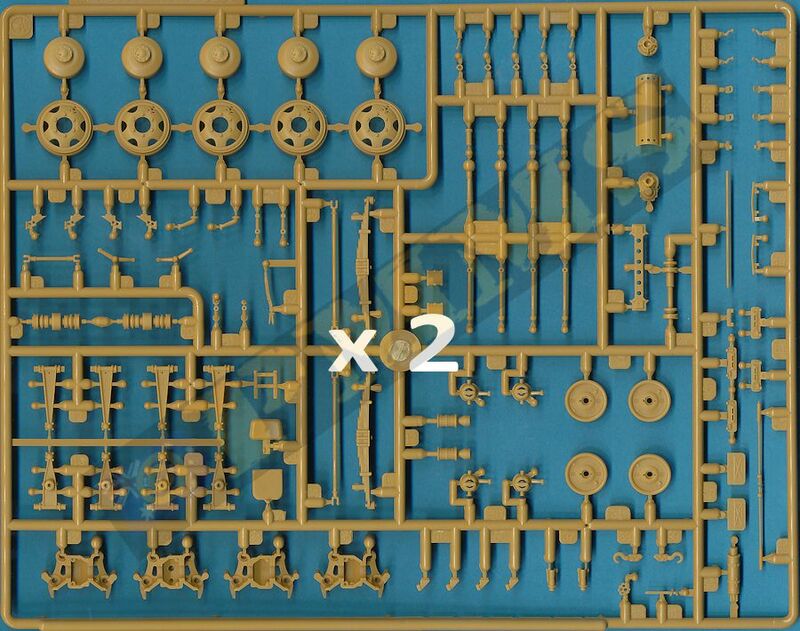 Both kits represent 1937 production 1.Serie Sd.Kfz.231/232 vehicles, actually designated Sd.Kfz.233 and Sd.Kfz.234 (Fu) in 1937 timeframe with the designations changing to Sd.Kfz.231 (8-Rad) and Sd.Kfz.232 (Fu)(8-Rad) in September 1940 but were the same vehicles, just the designations changed. 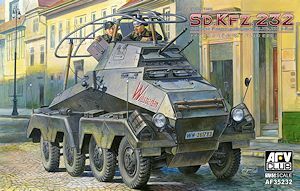 The 1.Serie Sd.Kfz.231/232 vehicles had a few notable external differences from later production batches; these include the early style vision ports on the hull and turret, no armoured cowl over the rear engine hatch and no large Zusatzpanzer (additional armour) at the front. 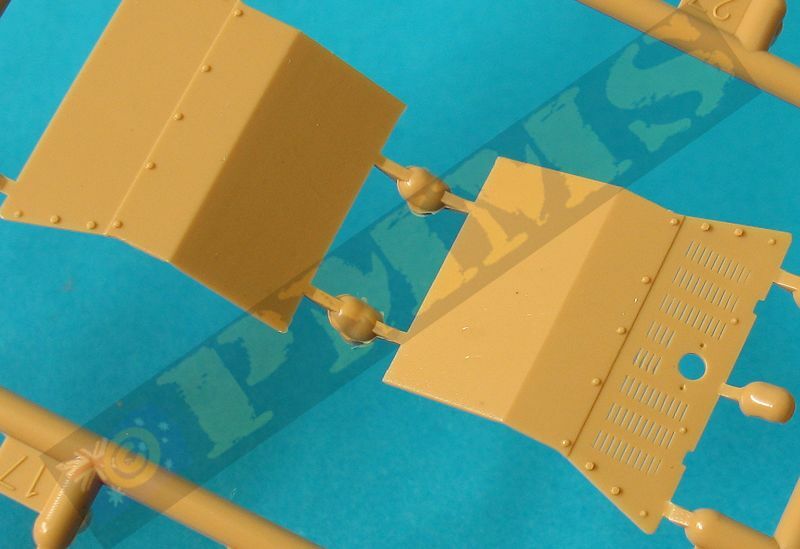 Another notable feature is the upper and lower hull join does not have the top hull overhang as with later vehicles and has a large folding anti-aircraft machine gun mounting on the left hull side, also all the hull and turret hatches sit proud of the hull/turret surfaces. 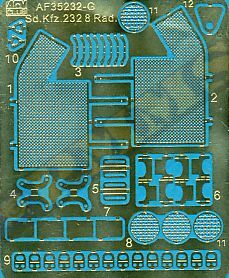 All of these features are captured well in the kit with all overall dimensions also matching the 1:35 plans in Panzer Tracts No.13-2 book and Ground Power magazines listed below well within accepted tolerances with only a couple of very minor discrepancies. 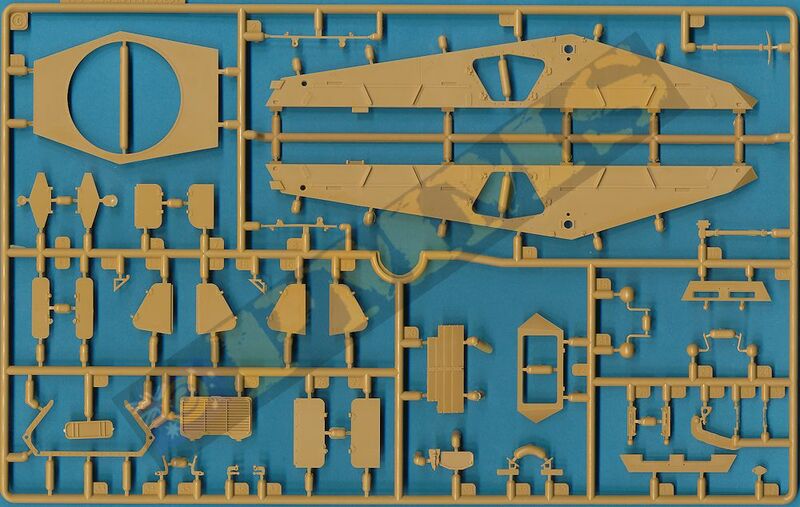 As we often see there are a couple of minor discrepancies between the plan dimensions but the overall hull/turret/wheel sizes are the same in both plan sets and hence also in the kit. The fenders on the 1.Serie vehicles had a number of changes quite quickly in the production run, initially the front and rear fenders extended down over the steering armoured covers, these were then modified still with the extended fenders but an angled upward kink to clear the steering covers and finally the front/rear fenders were shortened with straight lower edges to clear the steering guards, this is the configuration depicted in the kit fenders. 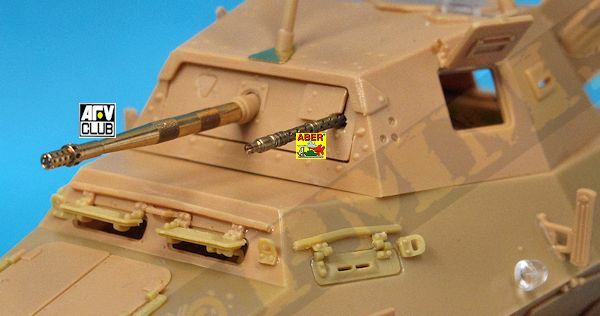 According to Panzer Tracts the initial 1.Serie vehicles were fitted with the 2cm Kw.K.30 automatic cannon and co-axial 7.92mm MG.13 with this changing to the 7.92mm MG.34 in March 1938 with kit including the MG.34 as turret armament. While it’s perfectly feasible the MG.34 could be retrofitted the kit has all the other initial 1.Serie features and should also have the MG.13 included. 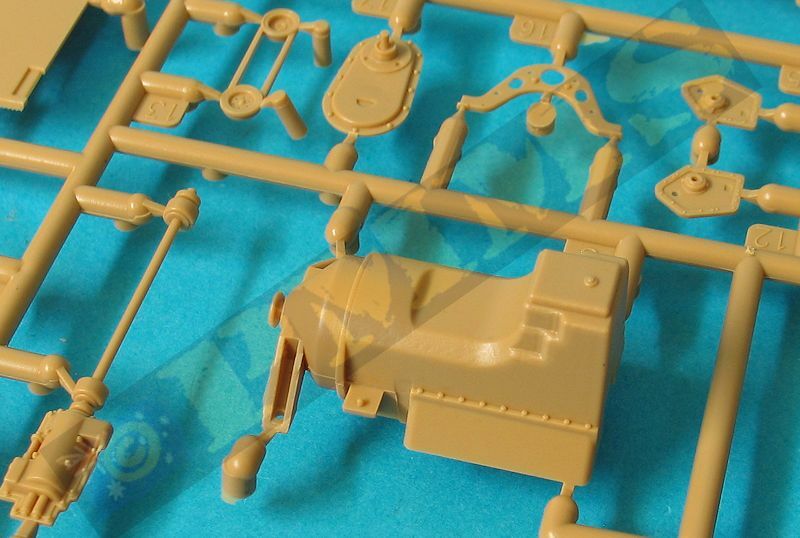 Externally the differences between the MG.13 and MG.34 are the MG.13 has a longer barrel/cooling jacket and extends further out of the turret mantlet than the MG.34 and the muzzle fittings are different on the MG.34. Overall there aren’t a lot of visual differences when the receiver is hidden away inside the turret so this may be overlooked by some but does provide scope for aftermarket barrel producers. Another point is the wheels on the initial production vehicles had six circular cut-outs in the rims and this changed to larger triangular cut-outs in later production wheels. The change to the triangular cut-outs appears from period photos to have taken place quite early in production as many photos of 1.Serie vehicles show the triangular cut-outs with some a mixture of triangular and round cut-outs so the all triangular cut-outs in the kit wheels is acceptable. 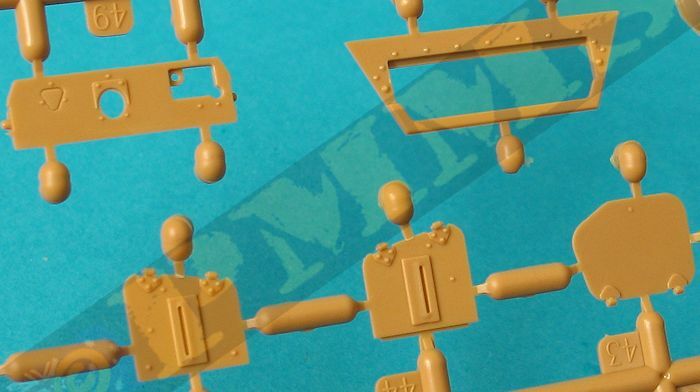 The quality of mouldings is excellent with clean crisp details and just a hint of fine flash on a few parts and the occasional pin mark but overall the quality is excellent with just the usual mould seams and extra plastic nodes to be removed. 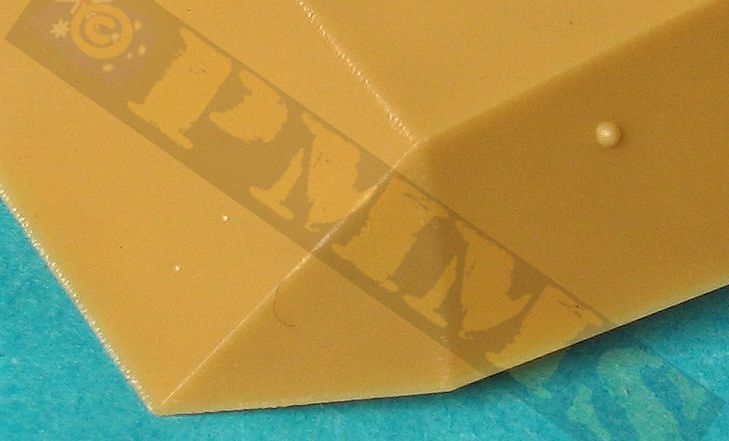 There are some long thin parts such as the hull side skirts/panels and the large frame antenna on the 232 that has some minor bowing, not enough to call warping and is easily remedied with finger bending to bring back into alignment prior to fitting. The hull panels are also pulled back into line while being glued to the hull but more on these later. 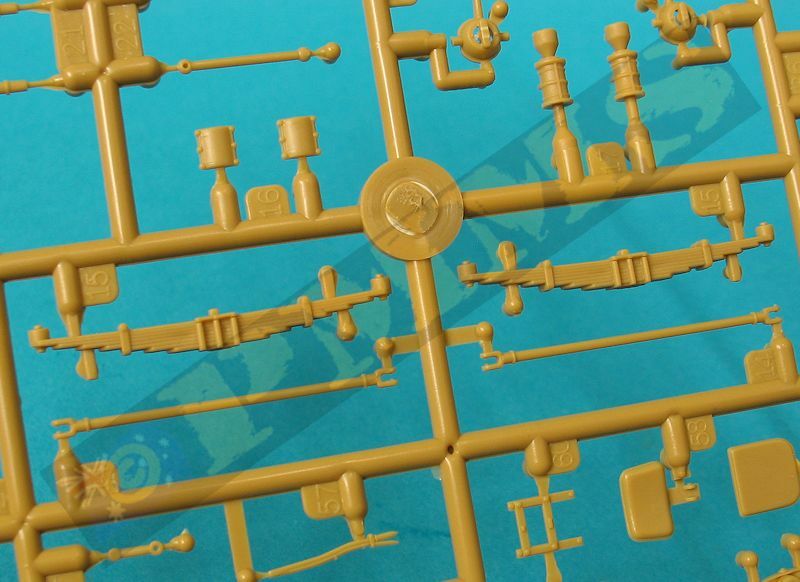 There are also quite a few very small fine parts to contend with and these will need care removing from the sprues as well as during seam clean-up and in fitting and some of the locating holes need to be enlarged to better fit the parts but nothing that’s difficult to contend with. 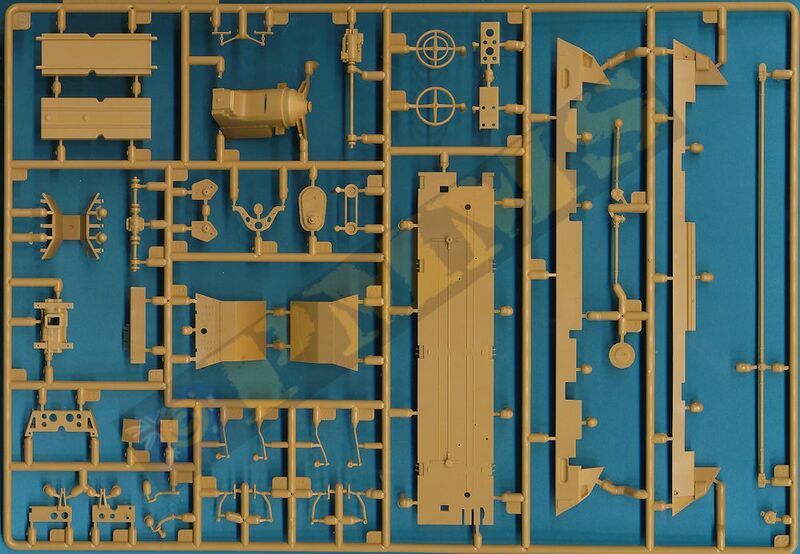 The kit also includes interior parts for the front and rear driver’s stations but most of the internal equipment storage is not included but you can’t see much of this internal detail in any case after assembly so in some ways it’s academic. 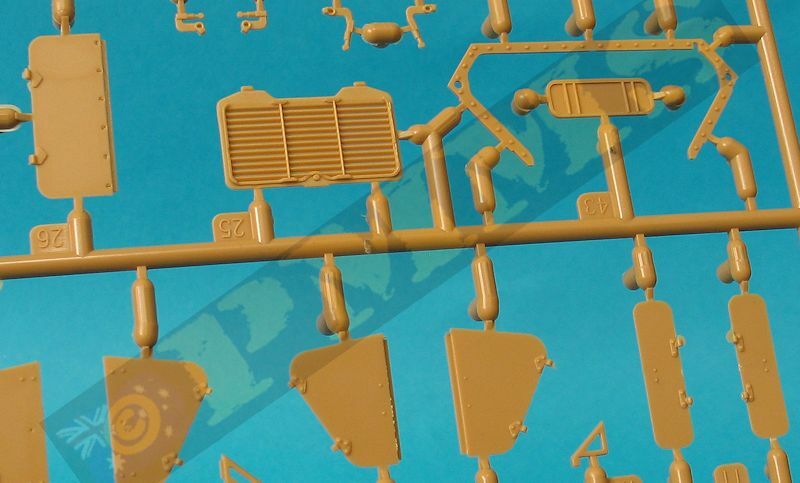 The main chassis is moulded in one piece and is perfectly straight and square housed in its own protective clear plastic container to prevent any warping during transit and added to this are a couple of cross members and the rear hull plate as well as a few suspension stops. Also attached are the front and the rear are the driver’s foot pedals mounted on chassis cross members and these need a little care fitting the separate pedals together and to the cross members, the rear steering wheel column is also fitted on the rear cross member and at the front is the steering column mounting but this is not identified in the instruction but is the small round part B24 in step 2. Foot pedals added to the front and rear chassis before fitting the hull tub. Moving to the suspension, it looks complicated in the instructions but is fairly straightforward really with each differential and axle assembly being similar, the central axle (part A10) has two vinyl covers (parts T1) added with the outer axles (parts A21) fitted into the covers and these hold in place inside the covers nicely without gluing with four units made. The axle units are then trapped between the differential halves along with the suspension swing arms (parts A12, A13) taking care not to glue the swing arms to the differentials or axles ball while assembling the four differential units, the front and rear units are joined with short drive shafts and covers making the larger two diff front and rear sub-assemblies. The fit of these sub-assemblies to the chassis is very precise making for a trouble free and secure fit with a central drive shaft added between the two suspension sub-assemblies. Added inside the chassis is the lower portion of the engine, the two part fuel tank and the engine drive shaft and transfer case and the long side mounted ducting tube. 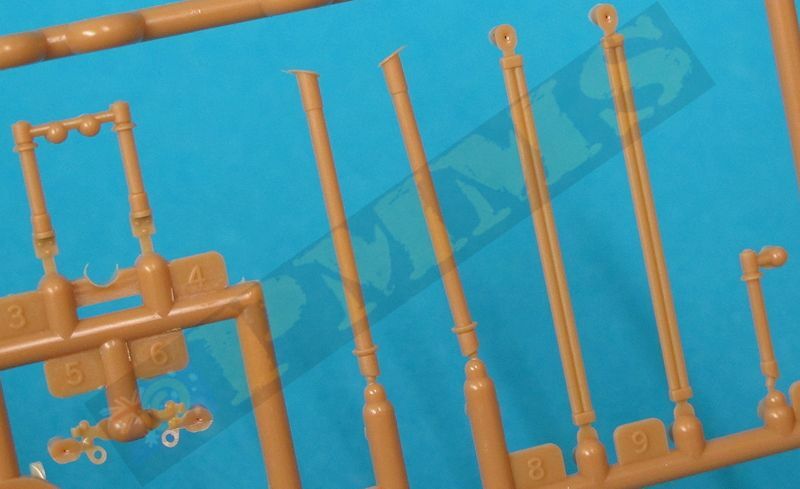 The suspension leaf springs are also added and you need to watch the direction of the central mounting bush for the left and right sides for each spring but other than that the assembly went without any fit or other problems. 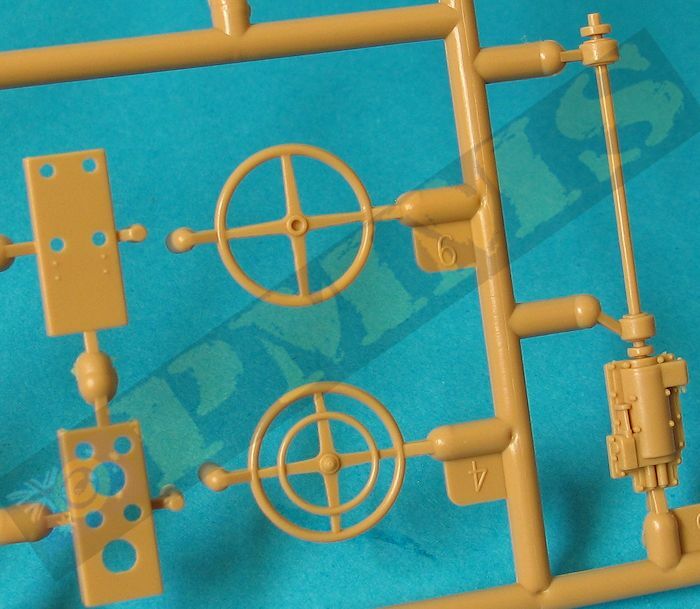 There is also the steering arms added between the two front and the two rear wheels, these are fixed in place and don’t have any effect on the kit wheels turning, but more on this below. Each of the eight wheels have four parts, the main wheel rim, the back brake drum face, the ball mounting and central attachment pin, note there are different brake drums for the opposing wheels on each side so check the part numbers to ensure these are fitted correctly. 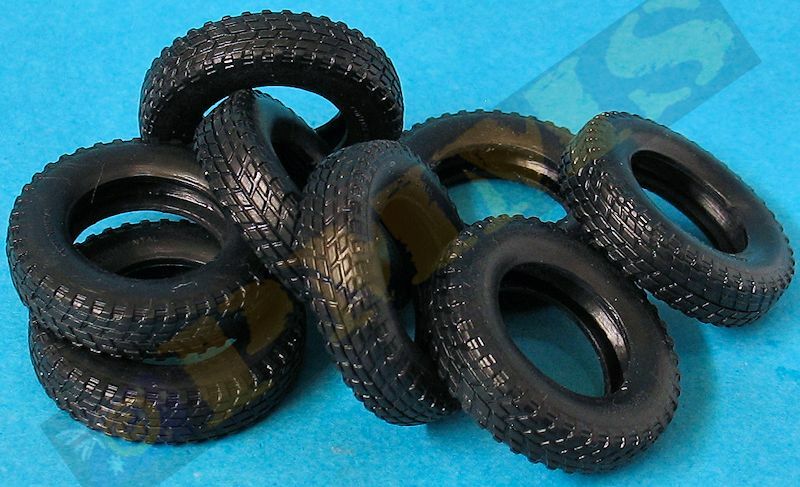 The vinyl tyres are cleanly done and have one of the standard tread patterns seen on 231.232 wheels and these fit snugly to the rims and on the outside of the rims are the two part valve ring and stem, these are very small and need care when fitting. 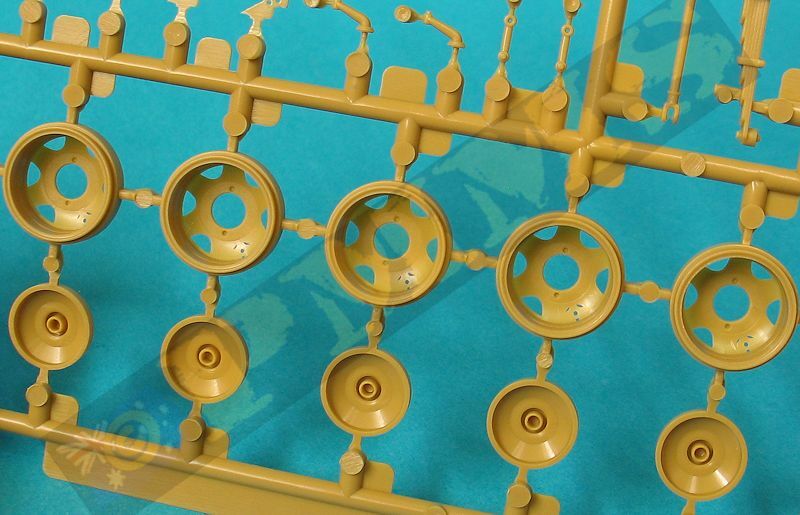 When fitting the assembled wheels to the suspension the ball mounting fits over the axle ball and two pins on each wheel locate into the suspension swing arms allowing the wheels to steer freely if not glued in place. It should be noted that the wheels can be positioned for steering but are not linked together and you can’t ‘steer’ the wheels in the conventional term. 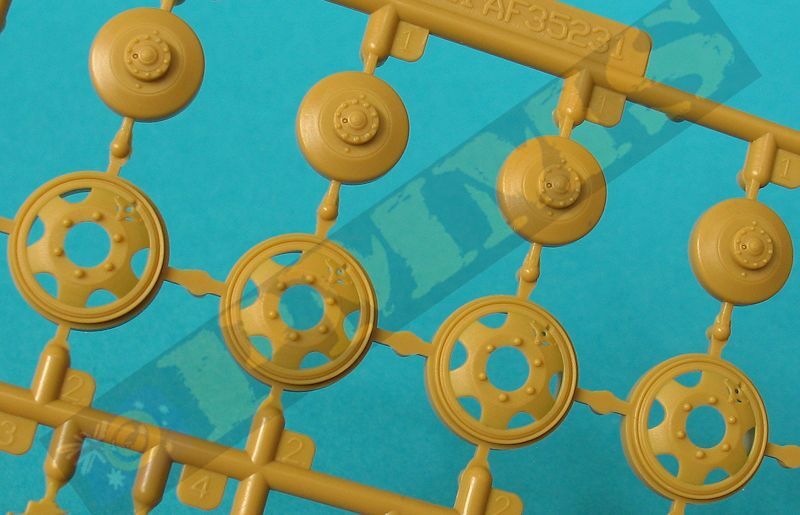 Each wheel has to be positioned independently to achieve the angled wheels if you wish to depict the kit with steering, note the front two wheels point in the opposite direction to the rear two wheels while steering. 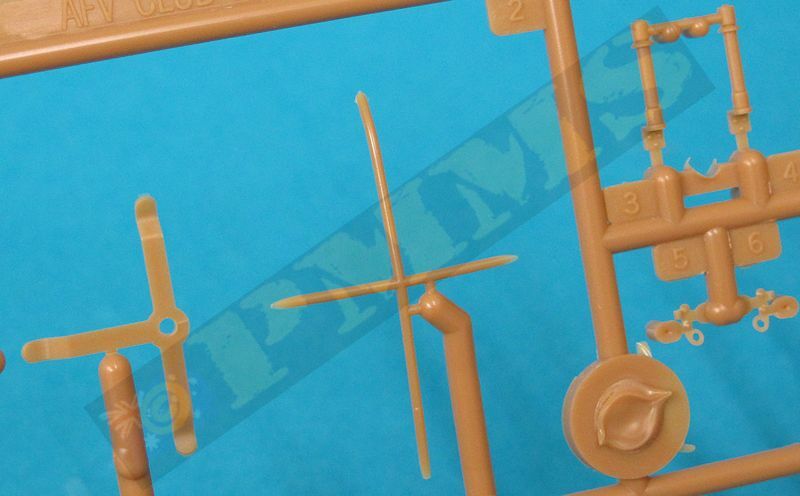 There are additional steering rods and linkages added to the suspension after fitting the wheels and again these can be glued at any angle depending on your choice of wheel orientation. 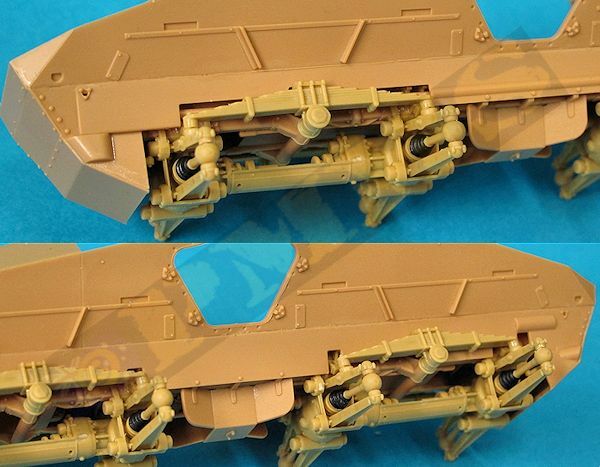 It is also better to leave fitting the wheels until after attaching the lower hull to the chassis as indicated in the instructions to allow the hull side panel to fit easier. Suspension ball mounting allowing the wheels to positioned. The large underside transmission guard (part B11) is added but take note of the direction as this is not clearly indicated in the instructions and this is also not fitted centrally but offset to the left and will only fit properly if the right way around, simply test fitting will tell you the right direction. This is made up of three main parts, the floor and two side panels with all three perfectly moulded without any warping and fit together snugly without any problems, you should also add the rear flange frame (part C33) at the same time to ensure the sides sit at the right angle. The assembled hull tub is then added to the chassis and this requires a bit of manoeuvring as you need to slip the front foot pedals through the floor slots and then fit the rear steering column through the rear floor hole and again slip the rear pedals into the floor slots. You may need to bend the rear pedals back a little to clear the floor and then reposition but once in place the fit to the chassis is also very precise but make sure the front and rear chassis are located centrally under the floor to avoid any fit problems later. Added along the lower hull/chassis sides are the long thin side skirts/panels and as mentioned any minor distortion due to the length easily pulled back into alignment as the panels were glued to the hull, glue one end first and then work your way along the hull gluing as you go and you need to ensure these are fitted evenly on either side for a better fit of the end plates. Chassis/lower hull tub with separate side skirts, any minor bowing of these is straightened as you fit to hull. Chassis/suspension and hull tub with side skirts fitted. When fitting the lower front and rear end plates (parts B20, B21) a little trimming was needed to fit, not to the outside dimensions that are fine but to reduce the thickness of the panels at the edges to better fit snugly to the side plates and test fitting will determine if any trimming is needed with your kit? The middle front panel (part B25) should have the inside flange designed to go around the foot pedals trimmed off as this just seemed to get in the way and prevented the panel from fitting properly to the hull but once trimmed the fit was good and as you can’t see that part of the inside hull after assembly it’s no big problem if you don’t have the section around the pedals. The large hull entry doors have inside latch detail included and can be shown open or closed as you wish, to fit closed you will need to trim the hull opening a little wider to allow the doors to fit snugly but other than the fit was good. At the back are the engine cover panel and separate louvered access door and these both fitted perfectly without any trimming required. 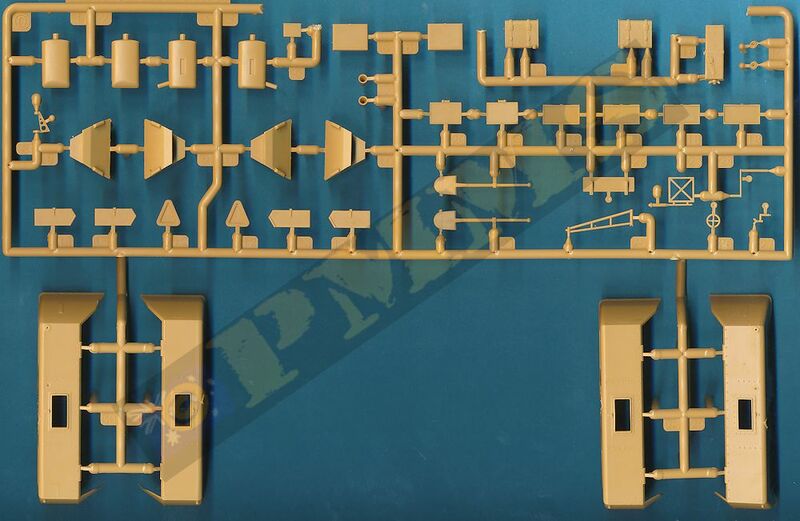 Each of the four large fenders have separate central lockers with separate top and front hatch covers plus the storage items such as shovels, fire extinguishers and horns on the applicable fenders and these can be built as sub-assemblies and fitted to the lower hull sides as one unit. Also added to the rear fenders are the exhaust mufflers with etched heat guards, these need careful bending to shape but look impressive when fitted. Other items on the fenders are the corner width indicator poles in thin plastic and you need to be really careful not to break these off or leave them till the vary last to save damage. 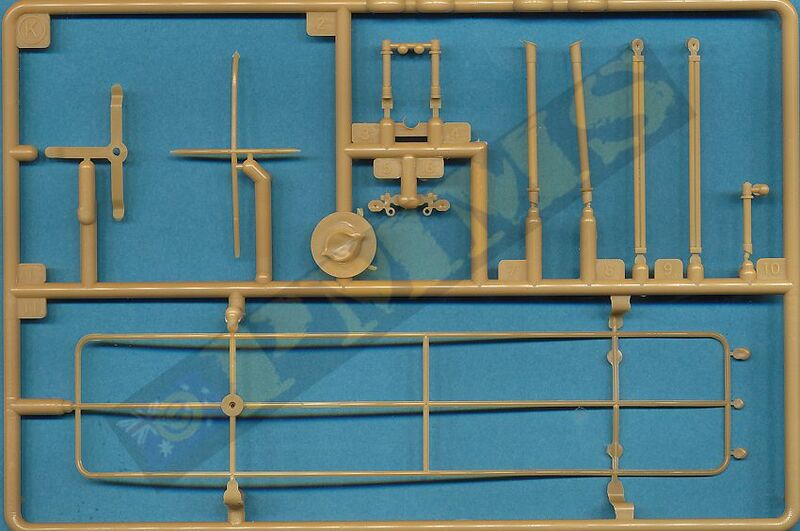 As mentioned the kit also includes interior parts for the front and rear driver’s stations that includes the seats, gear levels and instrument panels as well as the foot pedals already mentioned but apart from this there is no other internal equipment or storage included and with the 232 no radio equipment at all and this plenty of scope for this to be added but in the end you can’t see much of this internal detail in any case after assembly so it’s up to the individual if they want to add this? Another detail is the two side facing lights that have the clear plastic light with etched reflectors and etched slides plus the external doors that can be positioned open or closed and are quite nice when assembled, it’s just a pity you can’t see any of them after the hull is assembled, but at least you know they are there. If you include the lights note the etched reflectors are numbered incorrectly, they should be G7 not G4 as indicated, this has been corrected in the 232 instructions and I presume future 231 instructions as well. Overall view of interior with close-up of the side facing lights with etched detail. The upper hull is in five main parts, the forward and superstructure sections in one with separate front, rear and top plate plus and a separate engine deck, the hull has subtle weld seams included as well as rivet and panel details along with all the access hatches and visors as separate with separate hatch hinges and can be shown open or closed as required. The visors have separate upper rain channels which are finely moulded and need care in fitting, the channels also include the visor hinges and you need to position the channels perfectly centrally to ensure the visors line up with the hinges correctly. 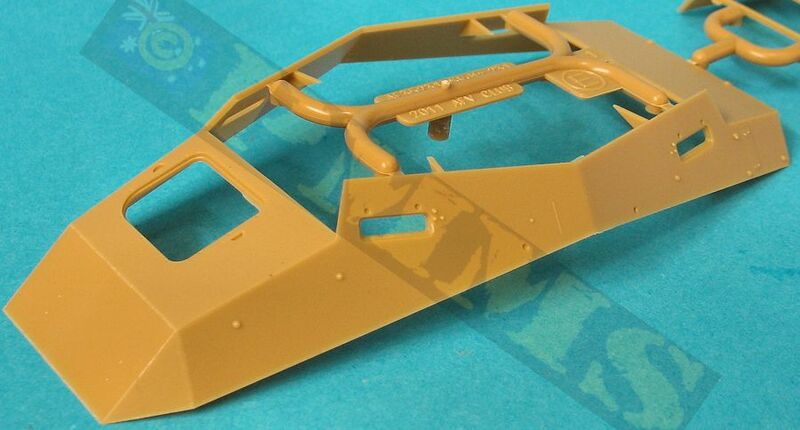 The superstructure rear plate is a separate part but you should note the instructions show to use the wrong visors, the rear visors are larger and you should use parts C28, C29 and not the same ones as used on the front plate as indicated in the instructions. The fit of the top plate is excellent with bevelled edges to ensure a seamless fit and includes the bolted turret ring although this is hidden when the turret is fitted. I found it easier to join the front and rear upper hull sections together and let the glue dry completely before fitting to the lower hull as it’s then one less join to worry about while fitting the upper and lower hulls together. The actual fit between the upper and lower hull was excellent without any trimming required, you may have to splay out the upper edges of the lower hull a little to mate with the upper hull but this isn’t a problem and remember the hull join on this early production version is flush without the top overhand of later versions. 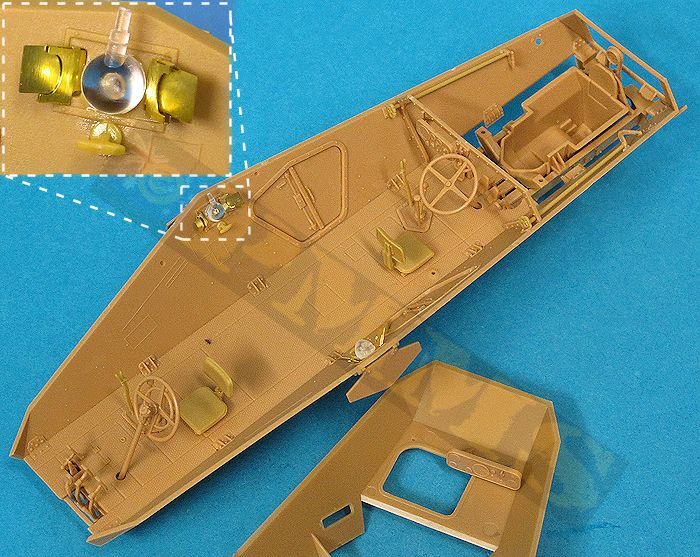 Additional items added to the hull include the side turn indicators, the four small clear plastic lights, the reserve fuel tanks on the front fenders and the eight small lifting hooks; these are also provided as etched hooks in the 232 kit to use instead of the plastic hooks if you wish. The front and rear head lights have separate clear ‘glass’ added but you should note the front lights are undersized by about 1mm in diameter which is quite evident when comparing to period photos. The etched fret in the 232 kit includes the wire mesh guards fitted to the front and rear lights and again this is undersized to fit the front headlights. The axe and pick axe added to the glacis have moulded on clips with partial etched clips for added effect but you may wish to replace these clips and those on the rear fender shovels with full etched tool clips for a better appearance? 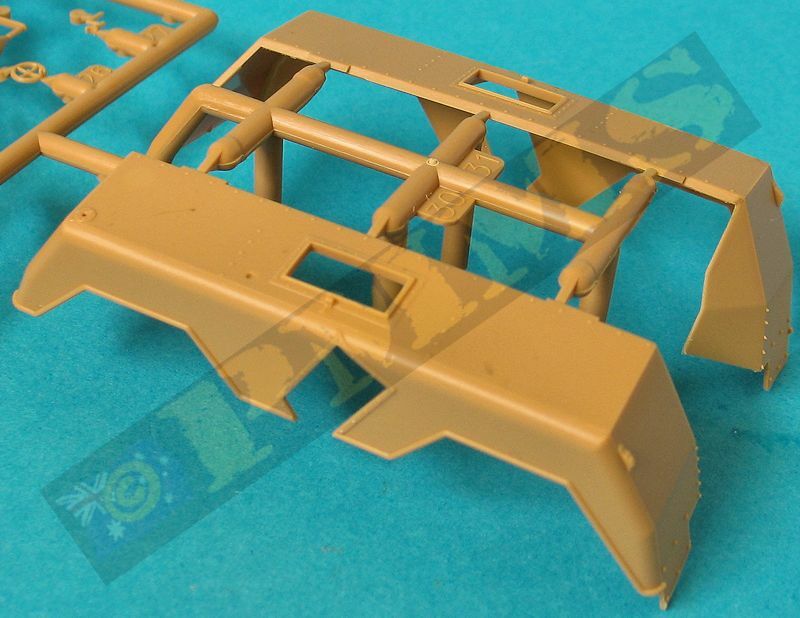 The three part AA MG swing mounting is also provided for the rear left hull, this was only fitted to the early 1.Serie vehicles as it was found to be quite useless in actual combat. The main turret shell is in one piece with a separate lower turret ring and again all the access hatches and visors are separate parts than can be shown open if you wish. 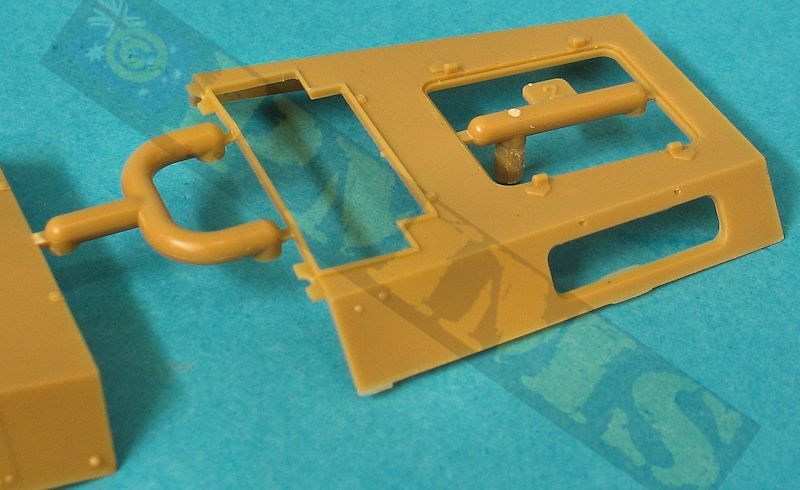 The large rear hatches have elaborate etched hatch stays as well as additional inner plastic latches for good detail. 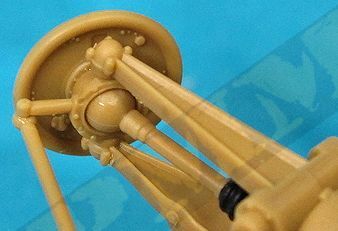 Detail on the turret is very well done with flush top screws and subtle weld seams on the side and top panel joins, the top periscope is in clear plastic with a separate cover and you can leave out the periscope and position the cover closed if you wish. 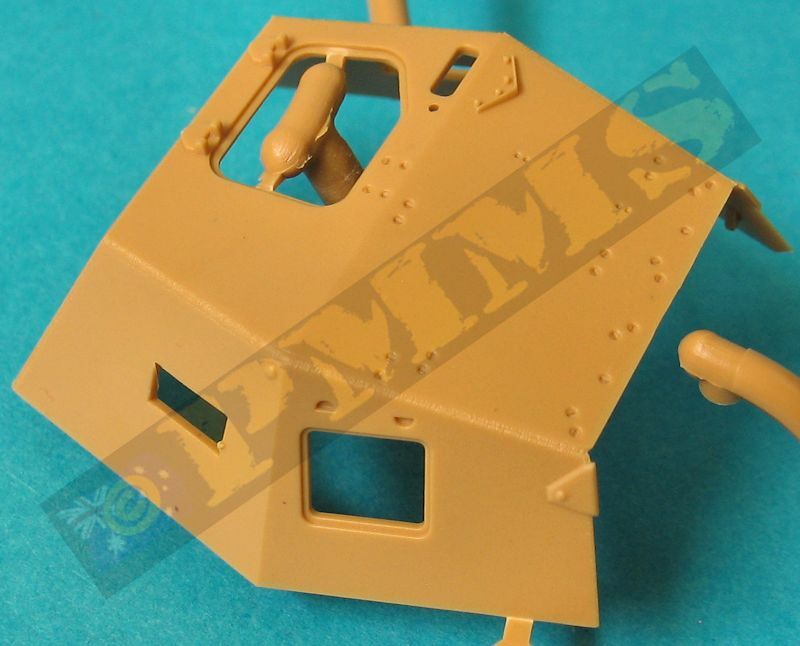 There is small dimensional issues when comparing to the 1:35 plans in Panzer Tracts No.13-2 book, these show the width at the front and height is correct but the width mid-point of the turret base is about .05mm too narrow either side and about .05mm too narrow either side at the back. The roof width and length matches the plans perfectly, the issues are only with the base dimensions. 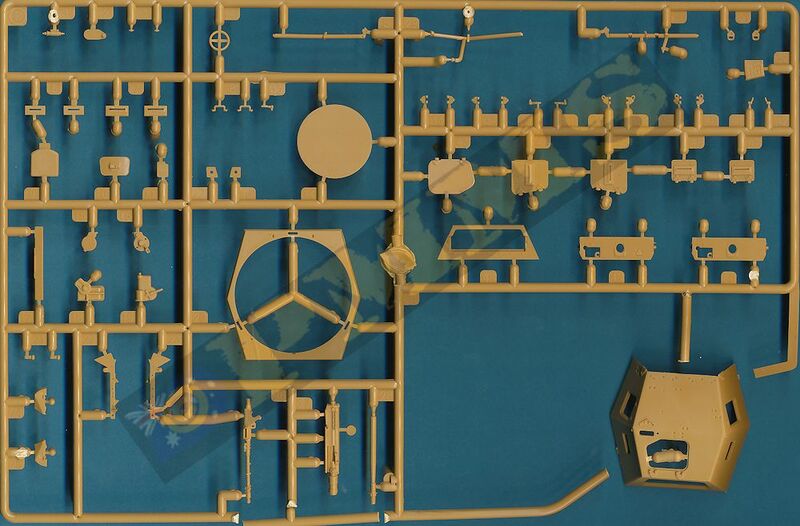 As mentioned above the various plans differ in some aspects and the 1:35 plans in the Ground Power books match the kit turret in mid-point and rear width as does the roof and height dimensions but show the front width is too narrow by about 1mm either side so when you have conflicting info it does create confusion but Panzer Tracts info is more current and well researched. The turret ring includes the traverse motor and handle as well as the Commander’s seat on one of the three support posts for the lower turntable to give nice inside detail, also included is the full 2cm KwK 30 cannon receiver with separate magazine clip and spent shell shut as well as the cannon mountings that fit precisely to the two part gun mantlet. The separate 2cm barrel is in plastic with fairly basic muzzle brake detail having just the bore hole drilled slightly and indentations for the gas holes, AFV Club have also released a separate 2cm KwK 30 metal barrel with excellent detail (set #AG35035) and this is designed as a straight replacement for the plastic barrel to improve the appearance. 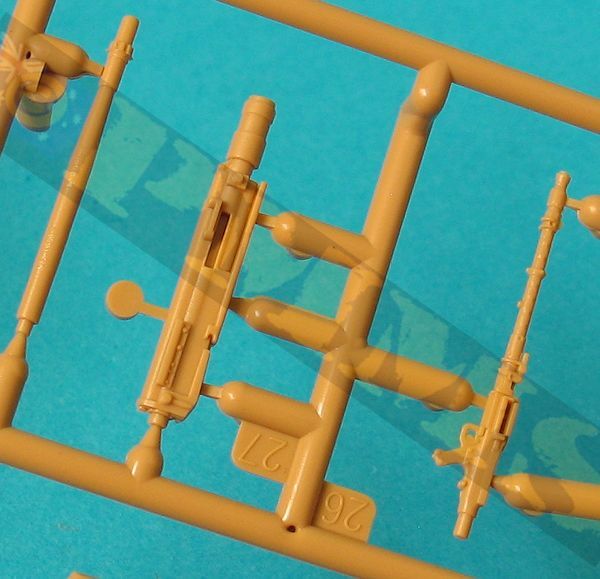 The MG.34 is also complete with receiver and is nicely detailed for a plastic gun but again will benefit with a metal barrel replacement for any of the available aftermarket barrels, also note the comments above regarding the early production vehicles being fitted with the MG.13 rather than the MG.34, there is also a separate MG sight cover provided. The mantlet is held in place inside the turret shell by two small brackets but these are not numbered in the instructions and part F13 is on the right side and part F12 on the left side for the correct fitting with the mantlet fitting very snugly into the turret front opening. The two larger side visors can be shown open if required but the smaller rear side visors are fixed in the closed position and the top hatch has additional inner latch and can also be shown open or closed. 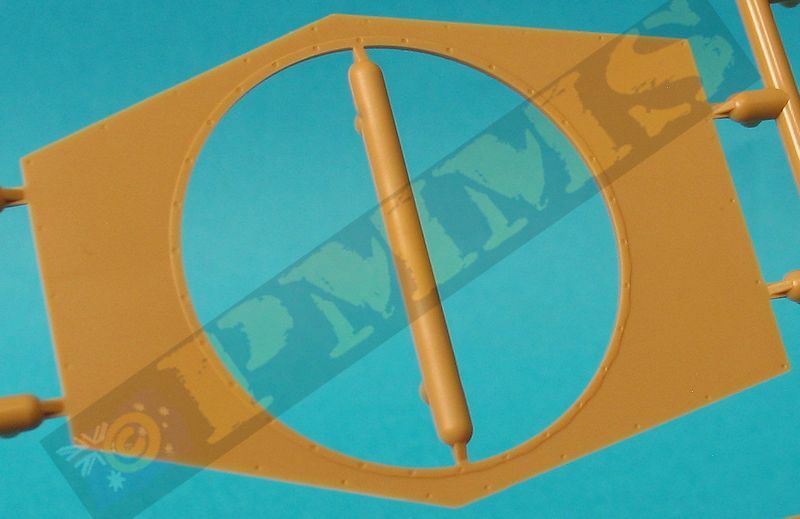 The fit of the turret to the hull top is good but there are small clips on the turret ring that will need some fine flash removed but you should note these don’t hold the turret securely in place and it will come adrift if you upturn the model. 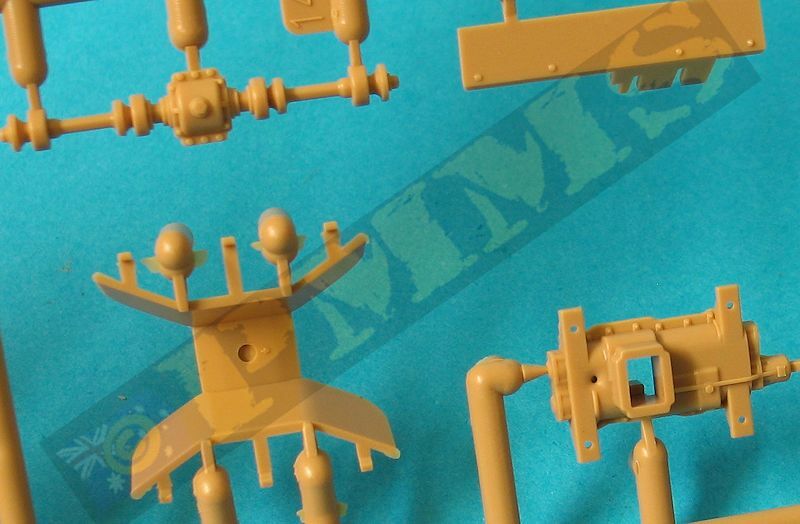 Assembled turret from the 231 kit with plastic barrels. and the MG34 barrel from ABER set #35 L-70. Also note visor details with the front visors in the open position. 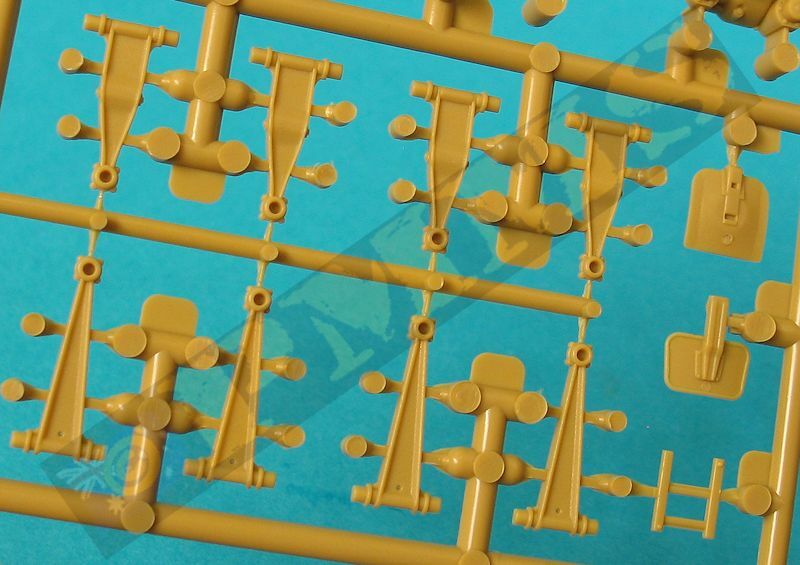 Obviously the main addition to the 232 kit is the large frame antenna and turret roof mounting, the only actual kit modification required to fit these parts is a locating hole at the centre front of the turret roof which you should drill out before assembling the turret. 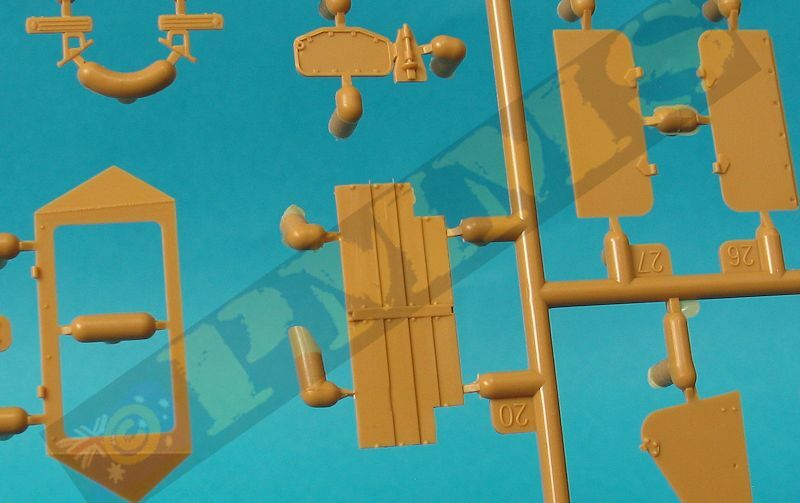 The large frame antenna has quite pronounced moulding seams that need careful removal and it’s best to do this while the antenna is still attached to the sprue for support, in any case care is needed as the frame is quite thin and fragile. There are a couple of dimensional issues with the frame antenna and mounting posts that may need attention? 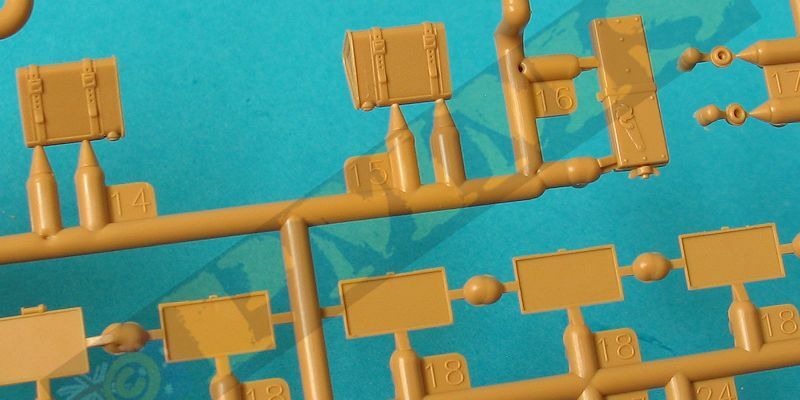 Firstly the frame antenna is a little short in overall length compared to the 1:35 plans in Panzer Tracts No.13-2 book, this is due to the outer corner bends being too sharp and it should be more rounded resulting in the end bars being a little longer. Also the position of the middle and rear cross bars is incorrect and sees the rear hull mounting posts leaning too far forward to mate with the antenna bar. To remedy this you need to carefully cut away the cross bars and reposition accordingly as per the plans, it’s best to cut and reglue each bar section at a time to retain the integral strength of the antenna. The rear mounting posts need to be more upright and this means you have to slightly alter the top and bottom bevel on the posts to sit correctly, this is a minor modification as far as some go and it’s up to the individual if they feel this is a problem or just go with the kit antenna as it comes. Another item missing is the aerial insulator plug on the rear hull deck and this can be made with plastic card discs and the aerial wire added from this fuse wire. 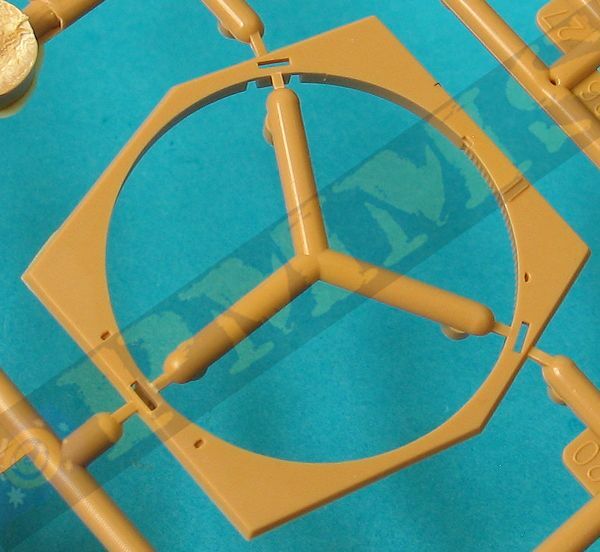 The assembly and fit of the turret roof mounting frame is straightforward without any problems but note when you sit the top antenna bush into the mounting hole there is nothing to actually hold this in place if you want the turret to still be traversable, if you plan to fix the turret in place than just glue the frame bush in place accordingly. 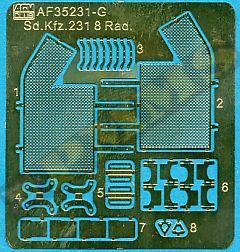 These are the usual exploded view type drawings that have clearly laid out assembly sequences that are easy to follow in most but some sub-assemblies are quite complex and you need to study the instructions carefully. 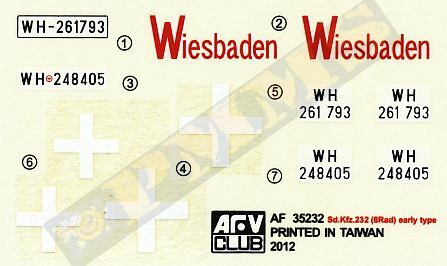 Paint numbers are provided for Hobby Color, Humbrol, Lifecolor, Mr.Color and Revell paints for the colours used on the kit. 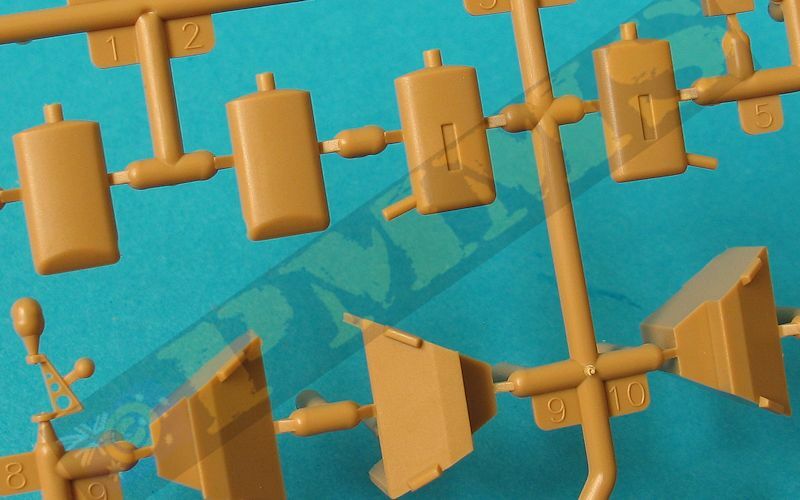 The kits are excellent representations of the early production 1.Serie Sd.Kfz.231/232 vehicles and capture all the features very well as these are quite different from later production batches. 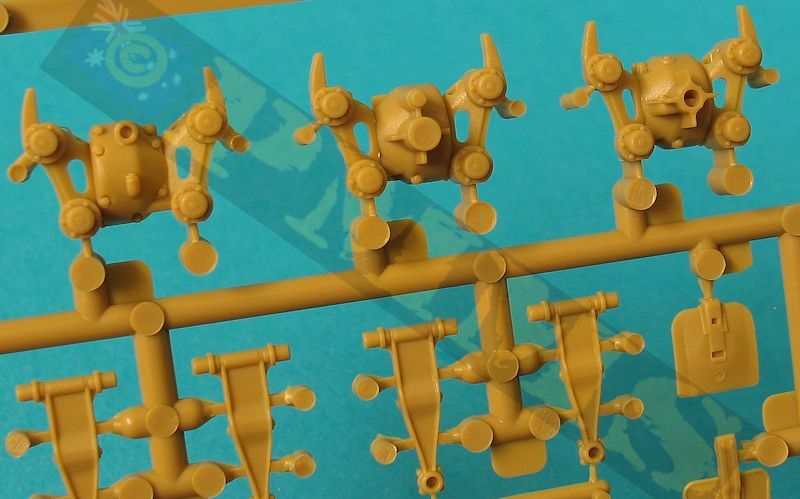 Dimensionally accurate apart from a few small areas with nice crisp details on the major hull/turret parts as well as on the smaller detail parts. Assembly is quite complex in places (suspension) and the kits are not for the inexperienced but overall the fit of the parts was very good with just some minor trimming required here and there and the inclusion of the etched parts for the exhaust muffler covers adds to the level of detail in the kits.